Valentine’s Day at home is not a copout. Nights out can certainly be special. I have to cover my bases, after all, because I’ve been extended an invitation to a hot date on Valentine’s Day which I had no part in planning. Surprises simultaneously kill and excite me, so I’m anxiously counting down the days. The past two Valentine’s Days, though, we’ve spent at home, and I think they turned out more memorable than a night out in a restaurant where the staff wants to turn our table as quickly as possible and offers a high markup pre fixe menu—my nightmare. On the first V-Day we celebrated together, Steve took control of the kitchen and made dinner for me–bacon-wrapped filet (of beef), I believe. Wow, have our diets changed! No matter the food, though, it was my ultimate special evening to have a break from cooking, and I got to sit at the dining room table sipping my wine and talking to Steve while he ran around the kitchen in a major change of roles. There’s a big smile on my face right now just recollecting it. If you want to spend Valentine’s Day at home this year with your sweetheart (or friends, pets, children, etc. ), but aren’t sure quite where to start, I’ve got you covered. The way I see it, it’s not about elaborate decorations, dressing up, or an over-the-top menu that would cost you more than that lukewarm pre fixe. Sure, if you and your company are into it, all those things can be fun, but what it’s really about is L-O-V-E (or maybe L-I-K-E if you’re just getting acquainted). 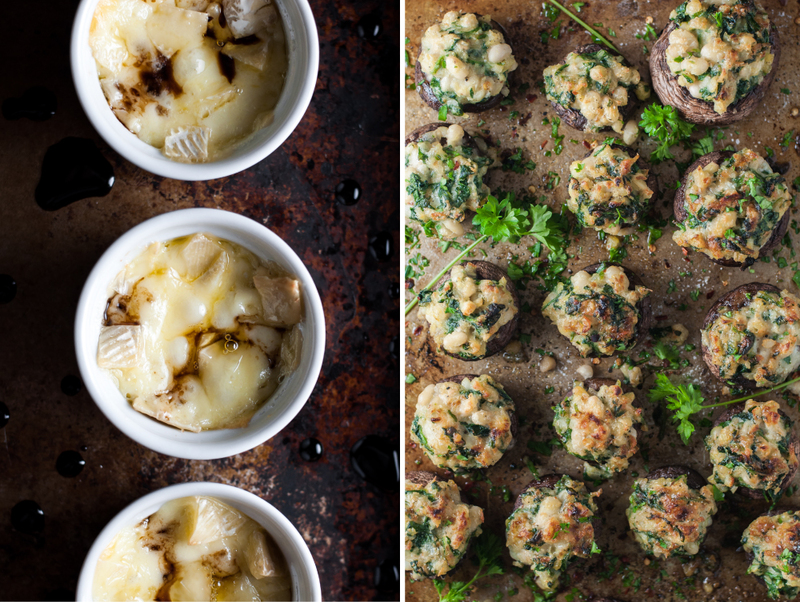 Food is clearly one of my favorite ways to show appreciation, affection, and all those warm fuzzy emotions associated with those closest to us, but cooking alone might not elevate date night at home to Valentine’s Day status. So today I’ll walk you through a hassle-free Valentine’s menu to make at home, then on Monday I’ll let loose with (at least) ten surprisingly simple, non-cooking ways to elevate the evening beyond your typical date night in. As Ina has recently proclaimed, “make it ahead“. While I haven’t had time yet to crack into the cookbook (one of many awaiting a moment of free time) of the same name, I agree with that strategy wholeheartedly. There are so many opportunities to do so in this menu, so that you don’t spend four hours of what should be quality time slaving over a hot stove. Short of boiling pasta or cauliflower and sautéing your veggies, you can cut, prep, slice, dice, and assemble ahead of time. It also helps to have table settings, glasses, and cooking equipment ready to go. Decide ahead of time whether you’ll clean up after dinner or save it for tomorrow. This is often a stressful point for me, but if I’m prepared it’s easier to let it go and just neatly stack the dirty dishes for the morning. Unless I plan really far ahead, I don’t like to further complicate a menu with fancy cocktails, when everyone’s just as happy with a simple drink poured straight from the bottle. If craft cocktails are your (or your significant other’s) thing, then play it up and spend time mixing them up together. Otherwise, here are a few ideas for simple drinks to get you started–all with some playful bubbles to set the mood. If you go with a cheese plate, keep it really simple for two: a small chunk of three varieties max, served with fresh or dried fruit and a few crackers. I tend to ignore the rules when assembling a cheese course for Steve and me, usually going with one of each of our favorites (hers – hard and salty; his – soft with a washed rind) and a wildcard. If you can find a good cheese shop near you, this would be the day to pay them a visit! Just don’t let them convince you to buy enough gouda for a small army. 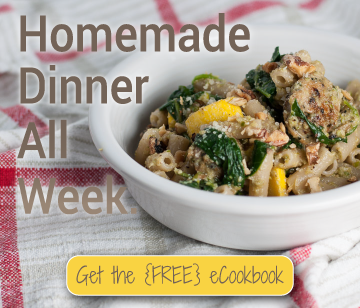 Both the other recipe options can be assembled anytime, then finished in the oven when it’s time for your first bites. The main event! Whip this up while your roasted squash cooks. 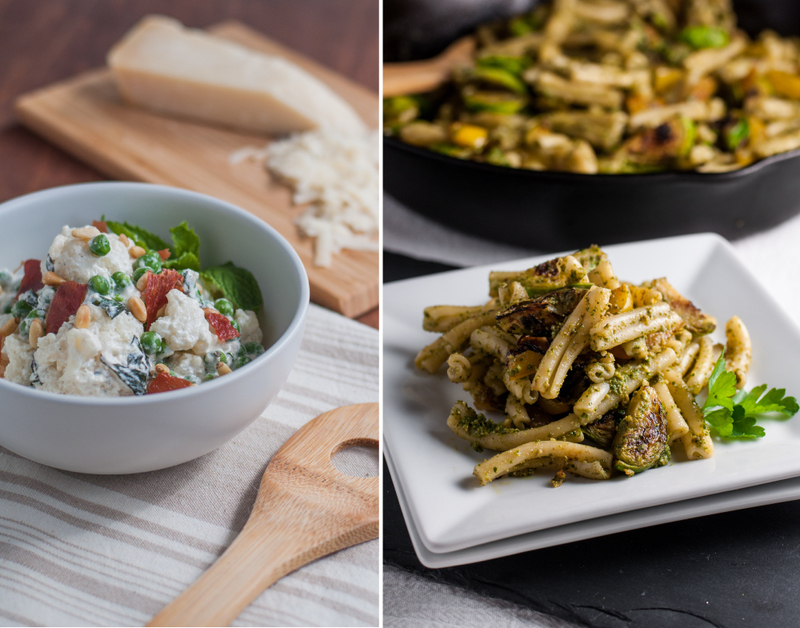 Each of these are loaded with veggies and easily a one dish meal, but if you’d like (and you’re really hungry), serve with some greens tossed with a simple vinaigrette or oil and vinegar. 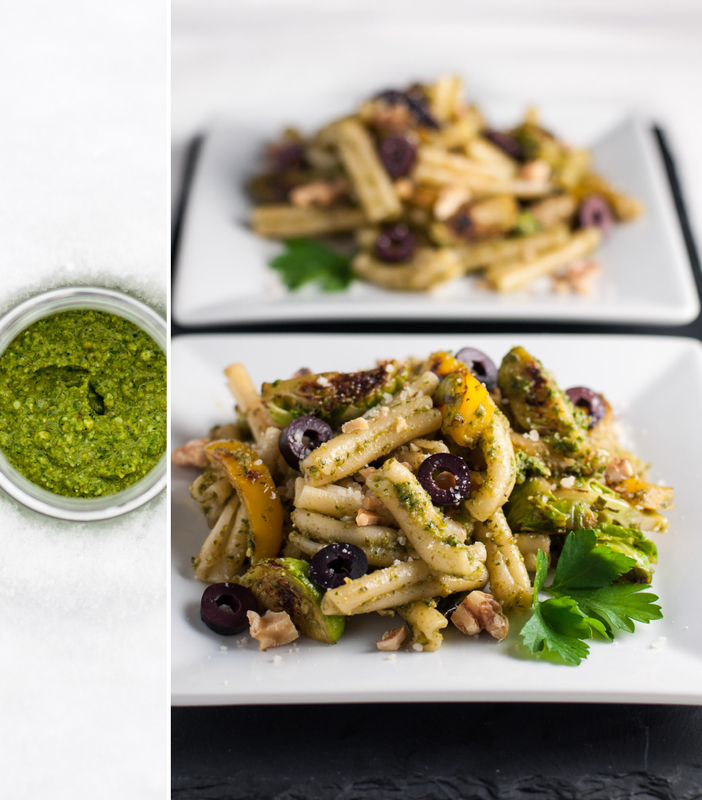 For the pasta, make pesto, toast walnuts, and prep the veggies ahead of time to cut down cooking time to the bare minimum. Squash cooks while you prepare the main dish. Method: Peel and halve the squash lengthwise, then scoop out seeds with a spoon. Slice 1/2 inch thick, lay on a rimmed baking sheet, and brush both sides with melted butter or a mixture of melted butter and olive oil. Sprinkle with salt and pepper. Bake in the bottom third of a 425 degree (F) oven about 40 to 45 minutes, flipping the pieces over and rotating the pan (so the front is now in the back) halfway through. Check for seasoning when done. Serve as is, or top with a little parmesan or crumbled blue cheese. 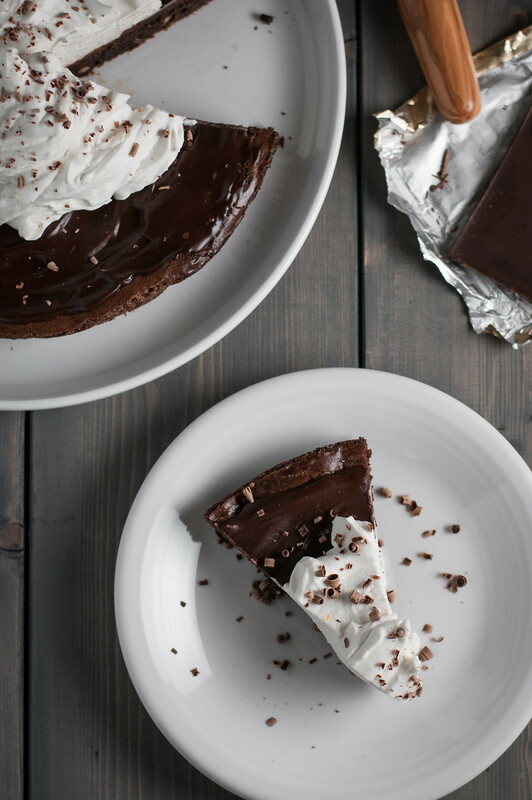 With these complete make ahead options, make sure to save some room! Fresh made desserts do taste, um, more fresh, but it’s going to be really difficult to notice that either the brownie or cookies were made a day, or even two, ahead of time. The coconut whipped cream, unlike dairy whipped cream, holds up for at least a couple days in the refrigerator, so just pile it on thick and you’re ready to serve. A one dish dinner for two that comes together quickly, so you can enjoy date night in...out of the kitchen. Continue the relaxation when you warm the leftovers for the next day's lunch. Toast walnuts in a 350 degree (F) oven on a rimmed baking sheet for 10 to 12 minutes, until beginning to darken. Stir once or rotate pan halfway through. Cool slightly, then roughly chop walnuts. While walnuts toast, prepare other ingredients. 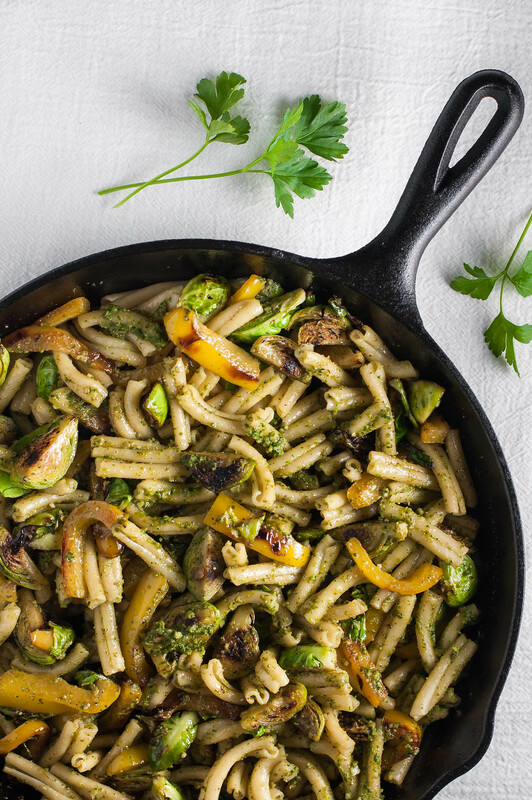 Make pesto ahead of time or first. Grate parmesan in food processor, if not pre-grated. Add parsley, toasted walnuts, garlic, lemon juice or vinegar, salt, and pepper. Process, scraping down sides of bowl several times, until a nearly smooth paste forms. Drizzle in olive oil while processor is running, until fully combined. 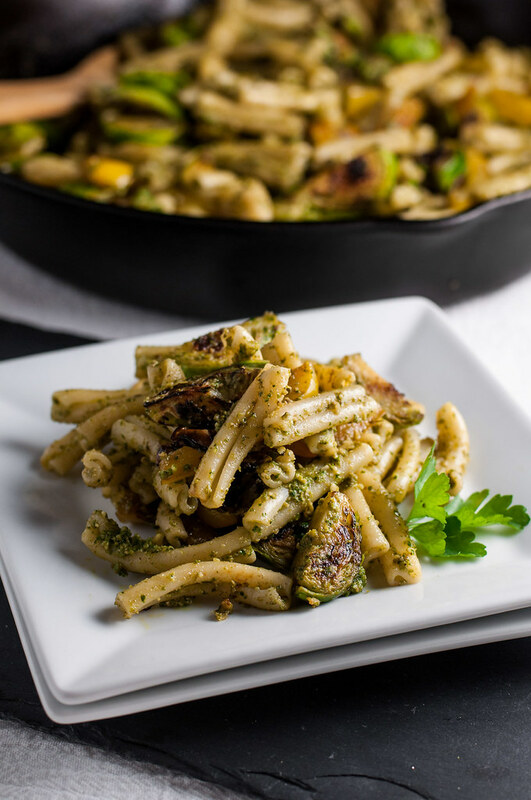 Taste pesto and adjust seasoning or other ingredients to taste (e.g., If you taste too much lemon, add more walnuts, oil, or cheese. Fat will cut the acidity.). Use immediately or store a few days in the refrigerator. Start boiling water for pasta and cook, al dente, according to package directions as you prepare and cook the vegetables. When draining pasta, reserve ¼ cup cooking water. Heat a large skillet (preferably cast iron) over medium high. When hot, add 1 tablespoon oil and heat until nearly smoking. Add peppers—they should sizzle—and spread in a single layer. Cook 2 minutes, undisturbed, until browned on first side. Continue cooking 2 to 3 minutes, stirring once every minute, until crisp-tender and mostly browned. Remove peppers to a bowl. Add another tablespoon oil to pan and allow to heat. Spread brussels sprouts in an even layer in the pan, turning one of the cut sides down. Cook, undisturbed, about 2 minutes, until brown on the first side. Cook another 2 minutes, stirring infrequently, until just edible when you test one. Turn off heat, add peppers back to pan, and allow pan to cool 5 minutes, stirring the vegetables occasionally if the pan is very hot, to avoid burning. Add most of the pesto and 2 tablespoons cooking water to the vegetables. Stir until incorporated and a pesto sauce coats the veggies. Add more water if pesto is very thick. If too much water was added, heat to a low simmer to reduce the liquid. 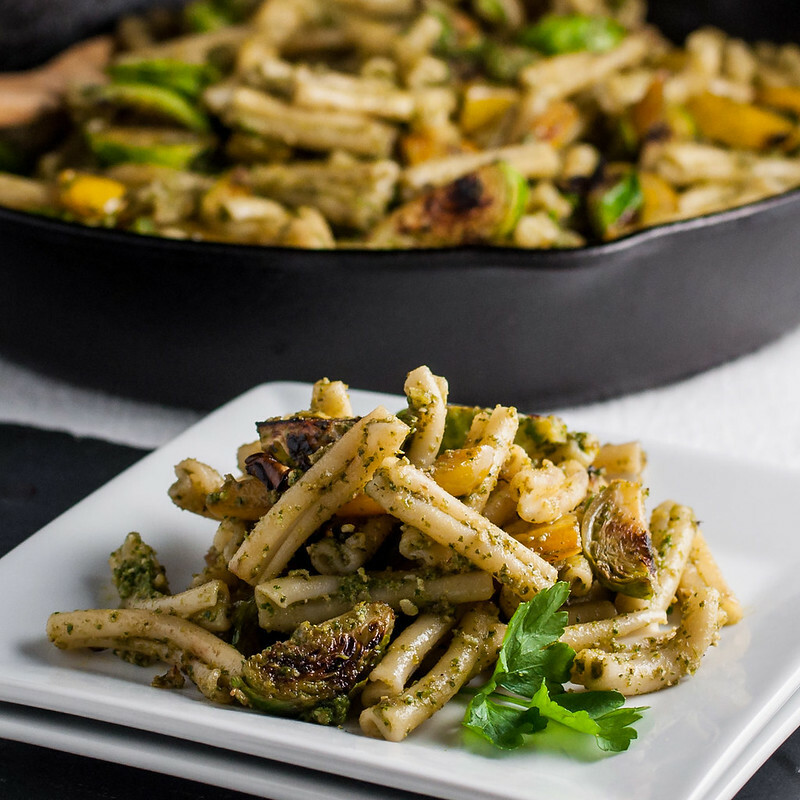 Add cooked pasta to pan and stir to combine and coat with pesto. If noodles have cooled, heat the mixture over low to warm. Taste and add remaining pesto, salt, and pepper as needed. 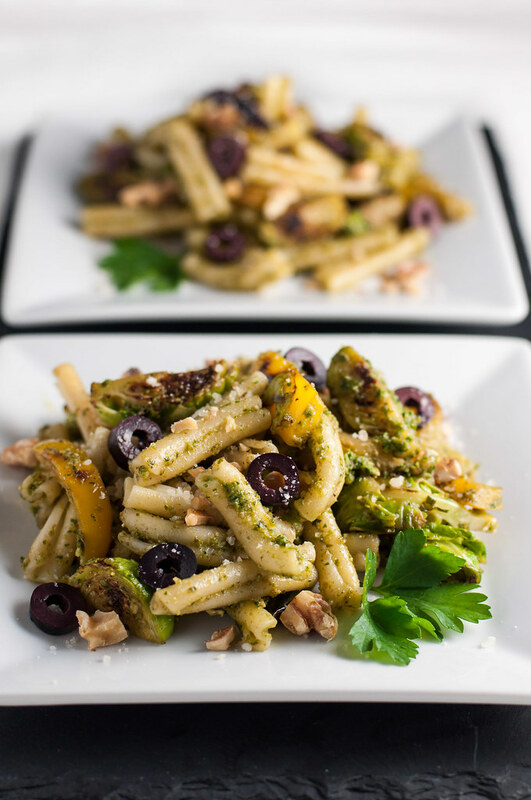 Serve warm topped with additional grated parmesan, chopped walnuts, and sliced olives. Best served fresh for most impressive results, but leftovers refrigerate well for a less formal lunch or dinner. To make it extra special, use artisan dried (from a specialty food store) pasta, homemade pasta (if you have a good recipe for it), or potato gnocchi. 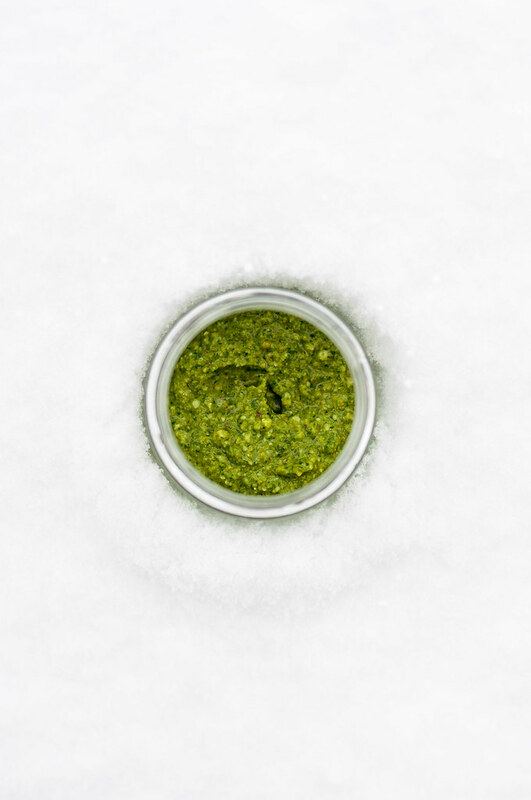 To simplify, splurge on a good quality store bought pesto. Many grocers now carry unique flavor combos from small producers, so use a special occasion to justify the price tag. Note: This page contains affiliate links. It does NOT contain sponsored content. Affiliate links (to products I recommend, on Amazon) offset my ingredient and website maintenance costs, so I can keep bringing you romantic recipes like this one. Thanks! So glad to find your beautiful blog! This Valentine’s menu is beautiful as well as being full of healthy goodness. Love it! 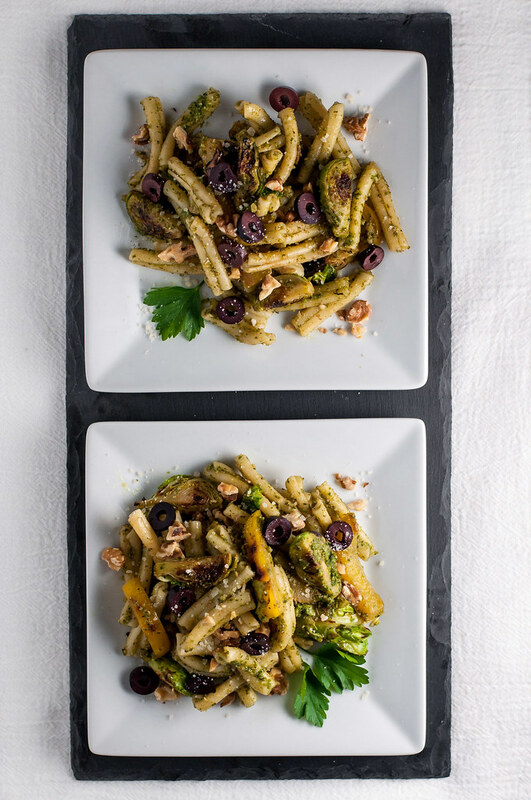 I’m a big pesto fan and this dish looks so yummy with the addition of the olives.